I recently read a book that I am just crazy over, although not crazy enough to do what the title suggests. 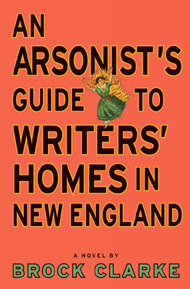 An arsonist’s guide to writers’ homes in New England, by author Brock Clarke, is a novel about an accidental arsonist of Emily Dickinson's house (and accidental murderer in the process). It also covers a wide range of issues from parental and marriage relationships as well as what it means to have lived your life not quite what you were hoping for. The Washington Post called the book a “straight-faced, postmodern comedy,” while the book can be found in our catalog under the subject heading Black humor (Literature). Clarke even has his own mini guide set up on the book’s website named “The Arsonist’s View” where you can create a blurb for your own memoir, read some would-be arsonist’s letters, and find some practical advice on becoming an arsonist. For all of this irreverent humor, however, I found the narrator’s poignant desperation to be the best part of the book. There is a sad sweetness in the way he describes his parents, his children, and even the group of stock brokers he lives with in his ten-year stay at a minimum security prison. But maybe that innocent sweetness is what is required in what, essentially, is a book about how to fail and succeed at life at the same time, and burn a couple of houses down along the way. I've always loved to read holiday and Christmas stories. My brother gave me a collection of Christmas short stories for my 10th Christmas-it included O. Henry's Gift of the Magi and stories by James Hilton, Thomas Hardy and Ray Bradbury-I've reread that book nearly every Christmas and still love the stories. Some of my other favorites include Mary Higgins Clark's Alvirah and Willie Meehan and Regan Reilly cute mysteries which always take place around the winter holidays. Another favorite is Truman Capote's A Christmas Memory, a wonderful story for all ages. For a lot of fun read John Grisham's Skipping Christmas - I can just visualize the snowman on the roof! And last, but not least-Dickens, A Christmas Carol - I've read this several times and seen so many movie versions-my favorite is Scrooge (1951) which stars Alastair Sim. One of my all-time favorite anytime movies. At Central we always display our holiday books-so drop by and pickup some holiday cheer! Or mysteries! Or cookbooks! It's a very appealing title (at least to a librarian), and the reviews are good..."Briskly original and subversively funny,...a fun little book" from Publishers Weekly, "delightful political-social comedy by a celebrated British writer" from Booklist.....so I thought I couldn't go wrong by sending this novella to a couple of book-loving friends. Well, I'm glad that I checked it out and read it before purchasing it and sending it as a gift. It's short (took me about an hour to read) which is good for busy people, but I found it boring---not good for this busy person. The Uncommon Reader is slightly funny, but it certainly didn't live up to its billing. The "surprise ending" was a dud, too. Maybe if I was an Anglophile or a great fan of British comedy, I would have liked it better. Now I've gone back to my usual choice of nonfiction, and I'm reading Three Cups of Tea by Greg Mortenson. The subtitle is "One Man's Mission to Fight Terrorism and Build Nations...One School at a Time". Are you looking for a good Book and your favorite authors have nothing new out? Librarians are frequently asked for recommendations on favorite authors or titles to read. While we enjoy these types of discussions, it can sometimes be difficult to match title to reader. As we move toward the holiday season and that yearly rite of making New Year’s Resolutions, I thought you might be interested in this list of 100 Best 20th Century Books from the “Hungry Mind Review”. It includes some nonfiction titles and more contemporary, female and ethnic authors than the traditional Modern Library list. Try a few of these titles and see if you don’t feel a little more “well read”. You may even be able to initiate an animated literary discussion at that next boring holiday office party! Do you love lists? Here are some more 100 best books lists. Originally posted by Linda E. - October 22, 11:24 a.m.
Back in February my library director forwarded an email from someone about the Romance Writers of America (RWA) national conference which would be held in Dallas in July. For the past several years RWA has had a “librarians day" included in their conference-which, for a minimal fee you get to mingle with lots of romance writers and get free stuff. I sent my response and fee back immediately! And finally it was July 11th! What fun-to mingle to authors, librarians (near and far), and publishers. To hear Jayne Ann Krentz and Susan Elizabeth Phillips, Nora Roberts and to get loads of free books and stuff! We had lunch with Shirley Jump, a delightful humorous contemporary romance writer. Other writers that I heard during the day were Suzanne Brockmann and former Arlington resident Shana Abe, Jane Porter and Barbara Samuel, Sherrilyn Kenyon and Sandra Hill. What a great day-very informative and well organized. Did I say how much fun it was!? Originally posted by Linda, July 18, 3:05 p.m.
Have you ever thought about joining a book club? Or maybe starting your own? Book clubs are a great way to meet people – or to find new sides to the people you thought you already knew. They can also open you up to books you’d otherwise never read – or the books you hear people talking about that you never take the time to read. Sure, you may think that someday you’ll get around to reading The Curious Incident of the Dog in the Nighttime because of the empathy you can gain from hearing a story from the viewpoint of an autistic narrator. Or eventually, you’ll get around to reading Garlic and Sapphires: The Secret Life of a Critic in Disguise because it really must be fascinating to find out why Ruth Reichl actually put on a wig and created a whole new persona just to become a food critic. But that’s not going to give you the drive to finish the last eight chapters in one night . . . not like if you had to be able to discuss how that new persona started strangling who she really was at the book club meeting the next day. Book clubs each have a different personality, and you may have to shop around to find one that will be a good fit. If you read nothing but classics, don’t expect a book club full of mystery fans to suddenly change their reading tastes to suit yours – you may have to branch out and read mysteries. But there’s also nothing that says they won’t read the occasional classic, for a change of pace. But before you go out and start your own book club, why not try one of ours? Three of our branches have book clubs, each with a different taste in books. They are currently reading Special Topics in Calamity Physics by Marsha Pessl for the July 10 meeting. Don’t have time to read it by tomorrow? Get started on Magic Study by Maria V. Snyder for the August 14 meeting. They are currently reading No Nest for the Wicket by Donna Andrews for the July 19 meeting. First Tuesday of the month at 7 p.m. They are currently reading Crashing Through by Robert Kurson for the August 7 meeting. Originally posted by Amber, July 9, 5:00 p.m.